NU style single row - NU style bearings have two machined flanges on the outer ring and no flanges on the inner ring. N Style single row - N style bearings have two machined flanges on the inner ring and no flanges on the outer ring, with rollers and cage on the inner ring. Like the NU style, the N has no thrust load carrying capability. NJ style single row - NJ style bearings have two machined flanges on the outer ring and a machined flange on one side of the inner ring. The roller and cage assembly is in the outer ring. The integral flange on the inner ring allows this bearing to carry an axial load. NF style single row - NF style bearings have two machined flanges on the inner ring and one flange on the outer ring, with roller and cage on the inner ring. Like the NJ bearing, these bearings have some thrust load capability. NH style single row - NH style bearings have two machined flanges on the outer ring and a machined flange on one side of the inner ring. A special-design inner ring allows use of a stabilizing ring on the non-flange side. As a result, these bearings can carry axial loads in both directions. The roller and cage assembly is mounted in the outer ring. NUP style single row - NUP style bearings are similar to the NJ style and come with a special ring often called a thrust collar. Mounted on the non-flange side of the inner ring, the thrust collar allows the bearing to carry an axial load in both directions. The thrust collar extends out of the bearing on one side, so the dimension across the inner ring is slightly greater than that of the outer ring. Double row styles (NN, NNU) - Double Row cylindrical roller bearings are denoted by two N's within the part number (e.g., NN or NNU). The dimensions for these can be found in the Super Precision section of this catalog and can be ordered with standard precision. S-Type - Sealed-Clean Bearings for chain conveyors demonstrate a high efficiency under high temperatures and wet conditions for a longer period with an improved sealing system. These bearings are packed with a quality grease of high thermal resistance and durability. Continuous Caster Roller Bearings - These are 2-split bearing units of a highly reliable design and feature a long service life. Cylindrical roller bearings with self-aligning rings having a proper alignment function. 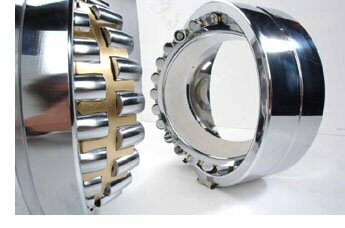 Four Row Cylindrical Roller Bearings - Are also popular roll neck bearings providing several benefits. First, the inner ring is separable form the outer ring and rollers which allows the inner ring to remain with the roll during grinding processes. This assures precise concentricity and negligible run-out providing for high rolling accuracy. Secondly, this design allows for greater radial load carrying and higher operating speeds. Four row cylindricals must be used in combination with a thrust bearing which is usually a two row taper, angular contact ball bearings, or a deep groove ball bearing depending on the thrust load present. Spherical Roller Bearings - Are double row self-aligning bearings capable of carrying heavy radial loads combined with moderate thrust loads in either direction. They are extremely resistant to shock loads and their self-aligning feature allows full capacity loading despite shaft deflection. Continuous Caster Rollers - These are 2-split bearing units of a highly reliable design and feature a long service life. Cylindrical roller bearings with self-aligning rings having a proper alignment function. Spherical Roller Bearings TL Series - Excellent performance with high temperature equipment. High strength to prevent inner ring fractures. Shaker Screen Bearings - Are designed for vibrating applications such as screens, feeders and compactors. These are self-aligning spherical roller bearings designed to accommodate the high loads, static and dynamic misalignment characteristics, and severe environmental conditions inherent in these applications. Triple Ring Bearings - Are specially designed for use with controlled crown rolls used extensively in the paper industry. These high load capacity bearings provide shaft within shaft operation, while simplifying the surrounding structure and installation. Four Row Tapered Roller Bearings Are very popular for use on roll necks. Most of these bearings are composed of two double cones (four Inner ring raceways), a cone spacer, two single cups (one at each end), one double cup (the center two raceways in the outer rings), and two cup spacers. They are very effective at operating under heavy radial and axial loads at low to moderate speeds. NSK four row tapered bearings are standardly supplied with carburized rings and rollers and are compatible with industry standards. Sealed-Clean bearings are four row tapers with seals for the harshest of operating environments. NSK's patented design provides the optimum sealing efficiency with only a slight loss of capacity.